EQUUS Foundation, a PATH Intl. sponsor, is participating in Animal Planet's R.O.A.R. Matching Campaign. EQUUS Foundation is asking all horse lovers to click this link every day from Oct. 14-Nov. 12. No donation is required, just a simple click. Equus Foundation is the only charity partnering with Animal Planet to represent horses. More clicks for EQUUS Foundation equals more funding for equine organizations. Click away, and thank you! PATH Intl. 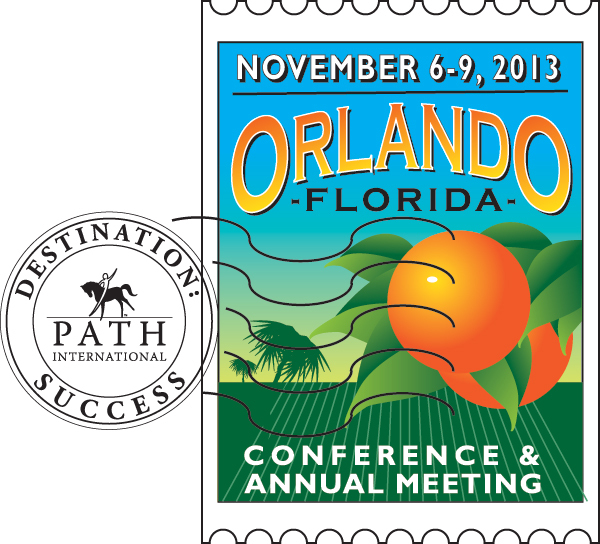 Region Representatives, serving as members of the Membership Oversight Committee, are the voice of PATH Intl. We thank them for their hard work and dedication to PATH Intl. We are pleased to announce the newly elected region representatives. Their term will start January 1, 2014. Congratulations! PATH Intl. will present two mandatory webinars this month for evaluators. For those of you who couldn't attend the webinar on "Report Writing," we will have another one on Thursday, October 24th at 5 p.m. MDT. On October 30th at 5 p.m. MDT we will present a webinar on "Exit Interviews." Both webinars will be presented by Sandy Webster. You will receive a link for these webinars via email very soon. Mark your calendars for both of these important and informative webinars. Thank you Sandy, for your time and talent and all that you do! If you work with veterans or are interested in offering programs for veterans, be sure to join us Wednesday, November 6th, for a full day of PATH International Equine Services for Heroes sessions. Included is "Boots in the Arena: Equine-Assisted Psychotherapy in the Treatment of Combat Trauma," presented by Eva Usadi. Using a filmed EAP session with a warrior, this presentation will demonstrate the importance of being able to verbally process the client's experience so that it can be integrated. It will also show how the horse's capacity to reflect underlying intention and emotion is critical to the healing process. Are you experiencing burnout or know someone who is? Come to "Instructor Enrichment," presented by the PATH Intl. Community Connections Instructor Group on Wednesday for encouragement and support. Increase morale while discovering ways to reduce burnout and stress. Everyone is invited to a special session during Community Connections Day: "Equine Nutrition," presented by Kelly R. Vineyard from Purina Animal Nutrition, the title sponsor of the conference. Learn about what's right for your center's equines, and discover the real facts behind common nutrition myths. Trainers at SeaWorld Orlando feed Shamu 230 pounds of food every day. We all love the thrill of the Olympics as we watch athletes excelling at something for which they have trained most of their lives. Our hearts beat faster as each team member contributes to the win, somehow becoming more collectively than they were as individuals. But what is it like to be those athletes, to participate on a team rather than be a spectator? We invite you to have lunch with a very special conference guest: Olympian Kyle Carter, member of the 2008 Canada Equestrian Team at the Olympic Games in Hong Kong, China. Competing in Hong Kong, Kyle had one of the best cross country rounds of the day. Kyle also competed in the World Equestrian Games ('10) where he and his Canadian teammates became WEG Silver Medalists. Kyle is also a national ambassador for Purina, title sponsor of the PATH Intl. Conference and Annual Meeting. This year's conference theme of Destination: Success is highlighted in the success Kyle has had, but that success is not earned alone. It is found in partnership and teamwork, a collaborative effort of all involved. Kyle will motivate your dedication and inspire us to go the distance as we pursue our own passions, including the success of PATH Intl. The Society of Visionaries is made up of a distinguished group of PATH Intl. members and friends who are devoted to sustaining its excellence and ensuring its future. Working as a team, this society enables PATH Intl. to provide the expertise, education and standards required to guide instructors, other professionals and centers in the provision of safe and meaningful equine-assisted activities and therapies to individuals with physical, developmental and emotional challenges during critical periods of their lives. Each year, Society of Visionaries funds are applied to further specific initiatives, advancing PATH Intl. toward its vision of being a global authority, resource and advocate for EAAT and the equines in this work that inspires and enriches the human spirit. PATH Intl. welcomes Kentucky Performance Products as a Gold Sponsor. Kentucky Performance Products is generously donating the registration bags for the 2013 conference. Thank you! PATH Intl. Welcomes Its Newest Sponsor, and You Benefit! PATH Intl. and the American Competitive Trail Horse Association (ACTHA) are teaming up to help your center raise money! Host an ACTHA event and raise $1,500+ for the vital work you do every day. ACTHA holds events that PATH Intl. Centers can host as a way to raise money for the important work they do. More on these venues can be found on the ACTHA website along with video examples of all ACTHA obstacles. Those interested in receiving more information can contact Robin Tilghman or call (434) 989-1437, or if you're ready to sign up, you can go to their events page. We think you'll find this a unique, exciting and enjoyable partnership! The American Morgan Horse Association (AMHA) is taking nominations for Morgan horses whose contributions have gone above and beyond expectations for its Therapy Horse of the Year Award. This award is given yearly at AMHA's Annual Convention in February. The horse may be a part of a recognized therapeutic riding program and ridden on a regular basis by an individual with a disability, or may be owned by individuals who benefit by working with the horse. The horse must be currently used in therapeutic horsemanship and be registered with AMHA to win this award. Nominations close November 1. For more information or to obtain a nomination form, go to the AMHA website. Questions can be emailed to AMHA or call (802) 985-4944. Tuesday, November 5th - noon to 8 p.m.